Ah E3. 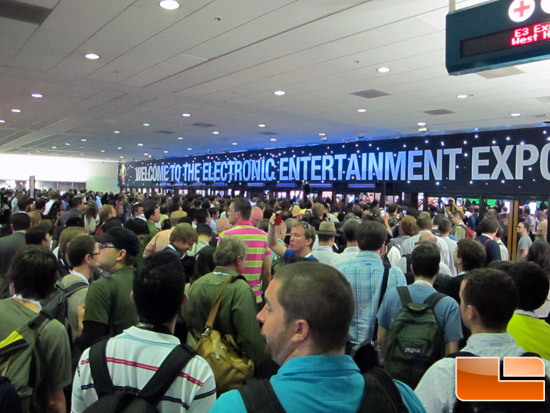 I haven't been to E3 since 2006, after which it was downsized due to how bloated and expensive it had become. I had attended every since it started in 1995, during the exciting early days of 3D hardware, through its steamy times in Atlanta and then back to Los Angeles, where it continued to grow beyond reason. E3 was always preceded by a time of focused crunch: trying to make a box of gameplay parts come together into a working, fun game, followed by days of overwhelming noise, nights of excess and then a period of recovery, where we tore out all the bailing wire and duct tape that held the game together. There were a lot of bad things about preparing for E3, but the best thing about it was that your game had to demonstrate fun to potential customers. It was a time when the entire team focused on making the game fun, rather than keeping up with a schedule for its own sake. I always felt that we needed more E3-like goals, but without the crunch, hacks and recovery. "It takes too long to create a stable build that runs at decent frame rates"
Very often, teams that start Scrum have an existing process that requires weeks of time to lock-down new feature additions and apply testing and optimization to achieve a playable build. Scrum puts pressure on them to find ways of reducing this overhead. It can take months or years, but eventually better practices and automation help the team keep the build stable and optimized enough to demonstrate value every sprint. "It's impossible to always show improved value every sprint. Sometimes it takes months for all the parts to come together to make a better game"
Late integration often shows that some design assumptions were incorrect, but the team is out of time and can't revisit them. 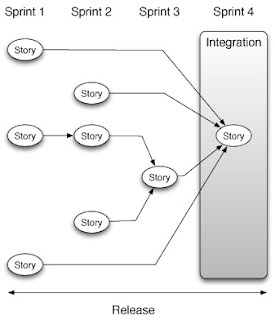 The team often lacks a shared vision of what they are building during the release. They focus more on completing tasks than adding fun. The end of the release starts to look like the weeks leading up to E3: Lots of crunching and hacking just to "get the build working". 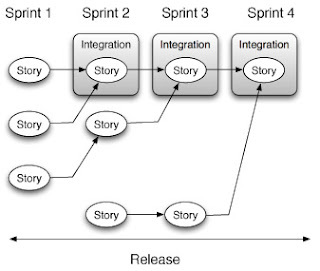 In fact, this cycle should never be short enough for a Scrum team. This is not to say that this will eventually lead to the game being improved every hour of every day. This attitude continuously influences the team to eliminate artificial process barriers (such as excessive baking time, long build practices, etc): all those expenditures of time and effort that are not spent directly improving the game. Producing an "E3 ready" build every sprint might not always be possible. 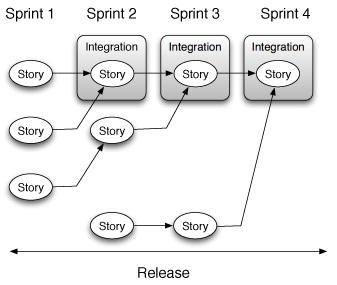 Tying up all the loose ends --making sure the build runs as long as possible on the target platform--takes a lot of effort, but teams should explore ways to find fun, build knowledge, reduce risk, refine cost projections every sprint. We benefit from looking at the game through "E3 goggles" more often, which lets us look at the game from the point of view of E3 attendees.